This is one of the oddest football plays you'll ever see. This is only possible thanks to CFL rules, which allow any player behind the kicker to recover a punt or a kick. We’ve seen a couple onside punts recovered for touchdowns recently, in 2014 and 2015, and we’ve also seen teams try a pass and then punt, but turning a field goal attempt into an onside kick is even rarer. And unlike some of those other plays, this really only worked because B.C. didn’t notice Miller lurking by the sideline; if they’d seen him, they could have sent someone over to cover that area. But the Bombers were able to catch the Lions napping on this one. However, the trick plays didn’t always work out for them. 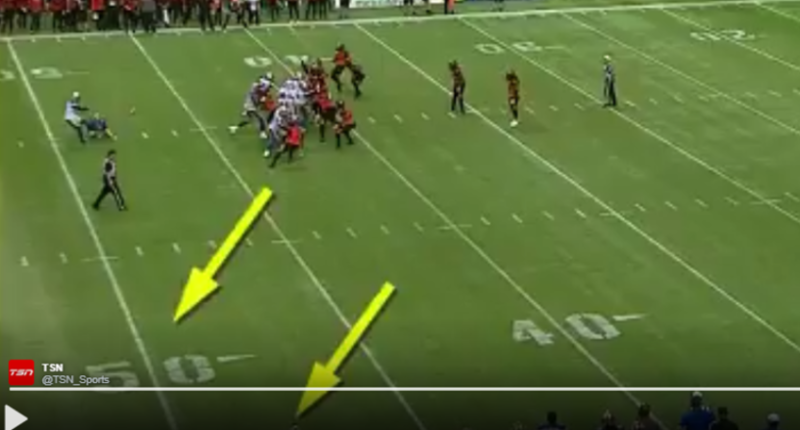 While up by eight in the fourth quarter, Winnipeg tried a fake punt deep in their own end, and a miscommunication saw Jones not even look for the pass. That led to B.C. tying the game 42-42 with a touchdown and two-point conversion, and they’d go on to win 45-42 following an interception, a field goal and a missed Bombers’ field goal at the end. Still, Winnipeg gave us one of the most amazing and unusual football plays in some time, and for that, we are grateful.